What is Selincro (Nalmefene) used for? Selincro (Nalmefene) is an oral medication prescribed along with therapy and lifestyle changes to help patients addicted to alcohol manage their dependence. It operates by blocking opioid receptors in the brain to prevent the effects of alcohol making it easier for the patient to resist urges to consume alcohol. This reduces the desire to drink alcohol so that lifestyle changes may continue to treat the mental aspects of the addiction. Your doctor may prescribe this medicine to be used along with others or for the treatment of other unlisted conditions, as well. How should I use Selincro (Nalmefene)? Selincro (Nalmefene) should be used strictly as instructed by your doctor to get the safest and most effective results from treatment. Your dosage and frequency of administration will depend entirely on your age, weight, health condition, and the severity of your symptoms. These should be swallowed along with a large glass of water and a meal or snack if you experience nausea. Never chew, split, or crush the tablets to avoid unintentionally destroying or altering the effects of their contents. Always ask your doctor any questions you have about the medication to ensure the correct administration. What are the side effects of Selincro (Nalmefene)? Inform your doctor as soon as possible if you experience any serious or worrying symptoms including severe fatigue, intense drowsiness, shallow breathing, faintness, chest pain, or heart palpitations. It may be necessary to reduce your dosage, frequency of administration, or immediate medical attention in serious cases to prevent further health problems from occurring. Selincro (Nalmefene) should not be used by patients who are currently using opioid medications, who have recently been dependent on opioid medications, under the age of eighteen, lactose intolerant, who have severely reduced liver function, severely decreased kidney function, or who have hallucinations or seizures caused by alcohol withdrawal. It is also important to inform your doctor if you are older than sixty five, who have psychiatric illnesses, moderately reduced liver function, moderately decreased kidney function, or who are currently taking fluconazole, diclofenac, medroxyprogesterone acetate, or meclofenamic acid. These conditions may cause unexpected health problems requiring alterations to your regimen. 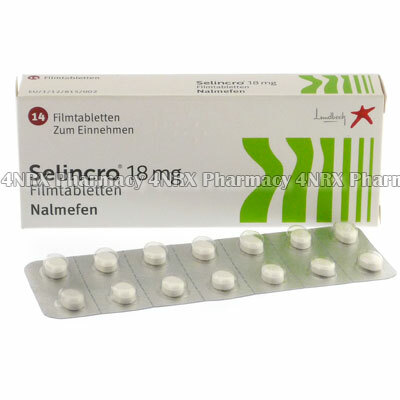 Strictly use Selincro (Nalmefene) as prescribed and follow all instructions provided by your doctor. Safe, suitable, and optimum dosage can vary and is dependent on the patient`s health and medical history, as well as the condition you are treating. Selincro (Nalmefene) may not be safe or suitable for all patients. Always ensure your doctor is informed if you are pregnant or breastfeeding, using any other type of medication (including non-prescription medicine, vitamins, and supplements), as well as if you have any allergies, other illnesses, or pre-existing medication conditions.